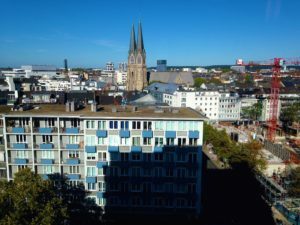 Situated along the Rhine, and separated by a mere 27 miles, are the heavily populated cities of Cologne and Düsseldorf. 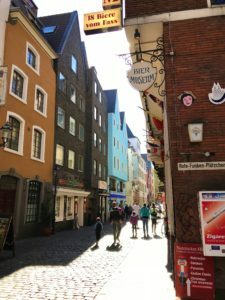 These two German metropolises, while essentially neighbors, are completely at odds with one another. 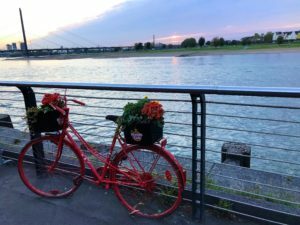 If you ask any resident of Düsseldorf which city is better, he or she will tell you that their city is definitely the best. 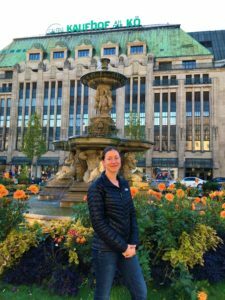 Not surprisingly, if you were to ask somebody in Cologne that very same question, you’re likely to get a similar response favoring their own neck of the woods. 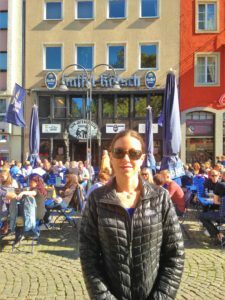 Not only is the architecture and various attractions in each city distinctive, the type of beer consumed in each city differs as well. 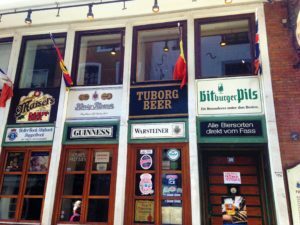 As you may very well know, when it comes to matters of beer drinking, there are very few things in the Rhineland of greater importance! 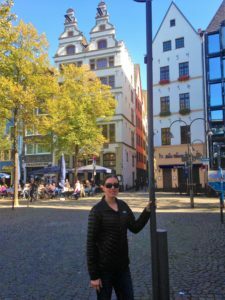 Rebecca in the cobble-stoned courtyard of Alter Markt (Old Marketplace), Cologne. 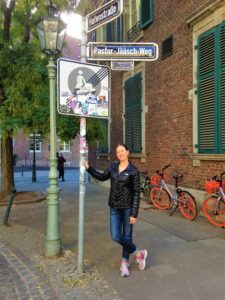 Not to be easily persuaded one way or another, Rebecca and I decided to take a self-guided tour of both Cologne and Düsseldorf to assess the situation ourselves . 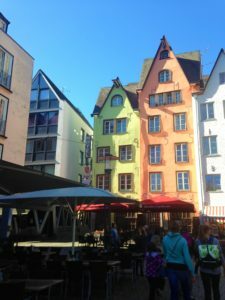 We would explore the varied sights, dine in the various restaurants, and sample each of the city’s distinct beers. Perhaps then, after some toilsome and extensive research, we could offer our own unbiased assessment and settle this long-winded debate once and for all! 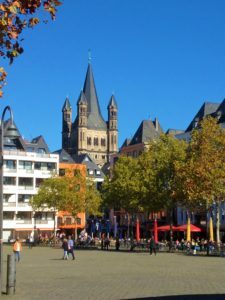 Cologne has an estimated population of 1,096,152 people. 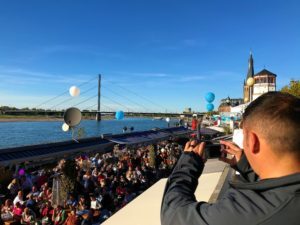 It is currently the fourth most populous city in Germany after Berlin, Hamburg, and Munich. 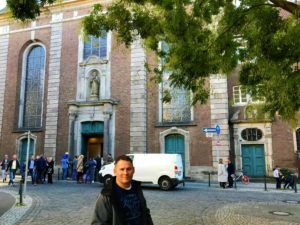 Of all the great things to do in Cologne, eating was definitely way up there on my list. 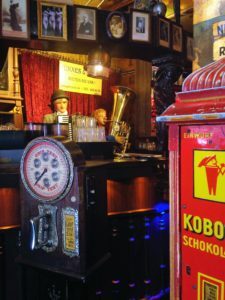 I would say that Papa Joe’s Biersalon was, by far, the funnest dining establishment we visited in all of Germany. 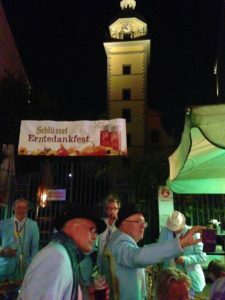 The traditional cuisine was delicious, the beer was great, and the atmosphere was fun for any age. A short clip of the restaurant’s interior captured from my iPhone. 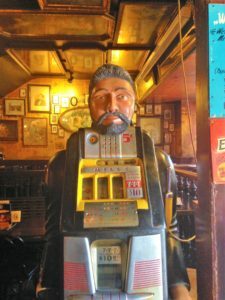 This guy wasn’t getting any of my nickels…. 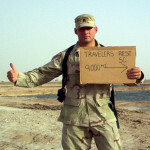 I didn’t have any nickels to give him. 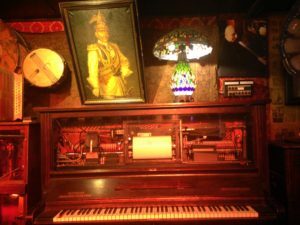 Who doesn’t like a good ole’ fashioned pianola to liven up the room? These guys could really belch a tune! 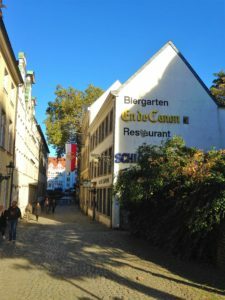 Kölsch is a popular type of beer originally brewed in Cologne, Germany. 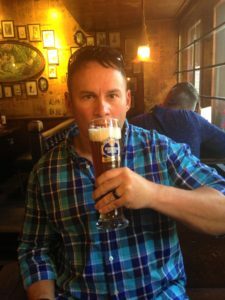 It gets its distinct taste and quality because its first warm-fermented with ale yeast, and then conditioned at cold temperatures like a lager. 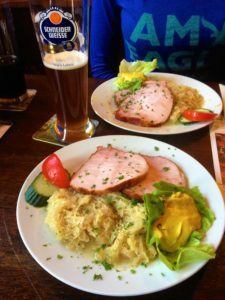 Yes, if you are a fan of German cuisine, this plate was as good as it looks! 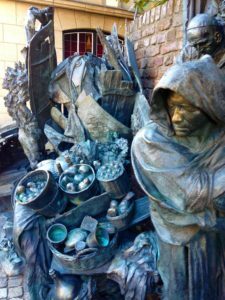 More scenes from Cologne’s Old Town. 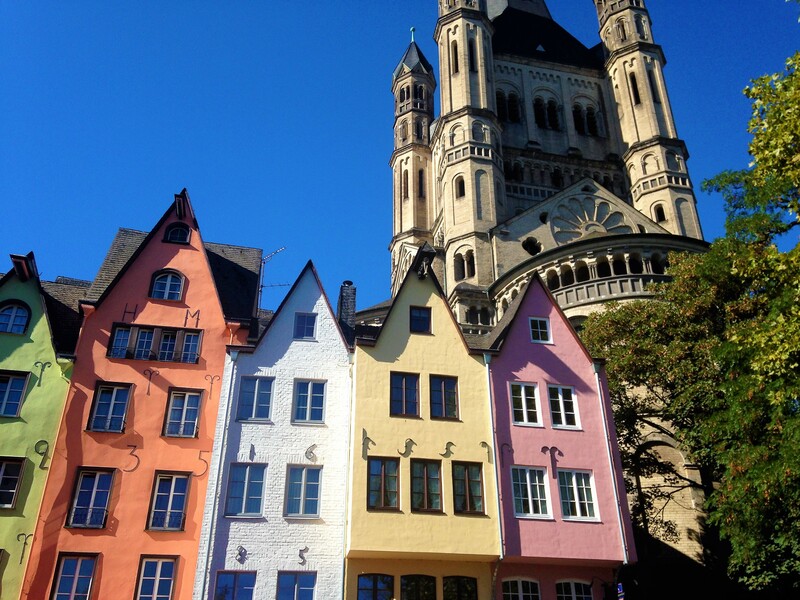 The Great Saint Martin Church towers over this row of colorful structures at a height of 246 feet. Believe it or not, the foundation of this church was actually part of a swimming and sports complex used for leisure by Roman soldiers. It dates nearly as far back as the time of Christ. 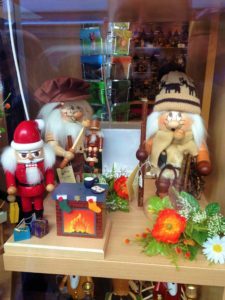 I just loved looking at all these wooden Santas, elves, and nutcrackers in this very German Christmas store. 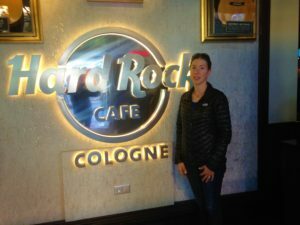 It’s been a long-standing tradition for us to get a picture of Rebecca at every Hard Rock Cafe we encounter during our travels . 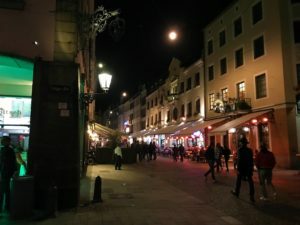 If you’re thirsty, there are plenty of places in Cologne where a person can get a beer! 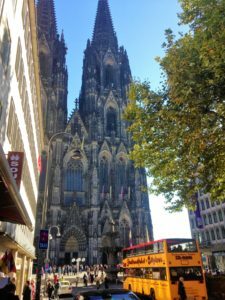 The Cologne Cathedral is the most recognizable landmark on the city’s skyline. This cathedral was so massively spectacular, I was unable to capture it all in a single frame. 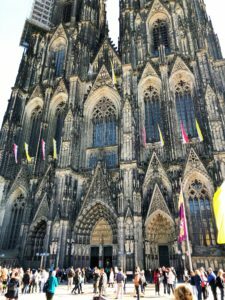 The first bricks of the Cologne Cathedral were laid down in 1248 AD. 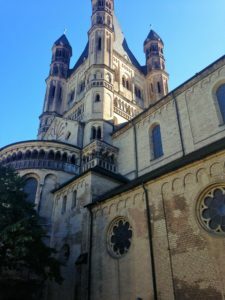 Although the structure was heavily damaged in World War II, the cathedral miraculously managed to survive the war. 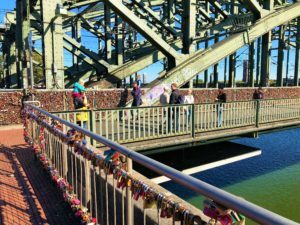 Over the years, thousands of couples have fastened “love-padlocks ” onto the railing of this bridge to symbolize their love and affection for one another. I didn’t have a padlock at the time of my visit, but boy, if I had… it would have been a big one! I really love my girl! 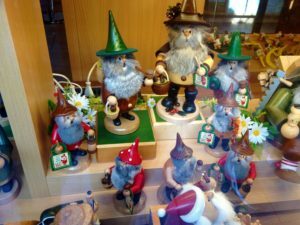 There’s no better way to learn about Cologne’s brewing history than at the Biermuseum. 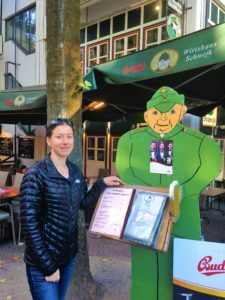 Rebecca peruses the menu at the Wirtshaus Schwejk, one of Cologne’s numerous dining establishments. 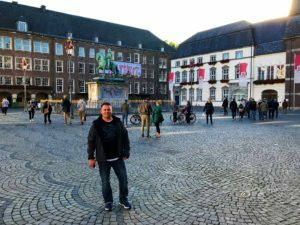 For me, Cologne had everything a man could want in a 2,000-year-old western German city parked along the lovely Rhine River. 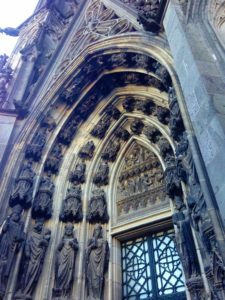 The twin-spired Cologne Cathedral gave the place a Gothic, medieval feel and its reconstructed old town let you know that you were smack dab in the middle of Rhineland. Rebecca and I had a lot of fun during our short visit there and our only regret was not being able stay longer. A view of Düsseldorf’s industry from our lofty hotel room. 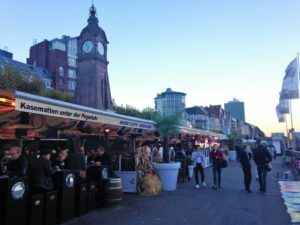 Düsseldorf is much smaller than Cologne, yet it seemed a bit more modern and industrial than its Gothic neighbor. 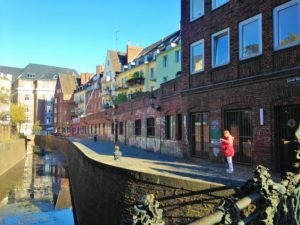 Although the city is well-known for their fashion and emerging art scene, a lot of German’s tradition can still be found in Altstadt (Old Town). 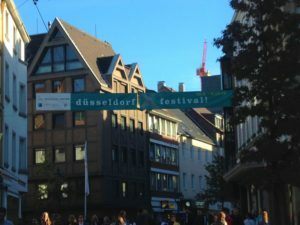 The Düsseldorf Festival is an annual event that usually takes place in the autumn months of late September and early October. 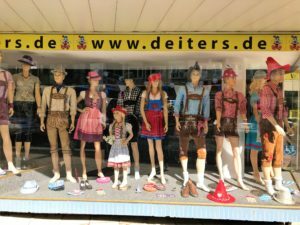 For lederhosen, or any other costume needs, check out Deiters online store. With the festival in town, Rebecca and I were determined to dress for the occasion. 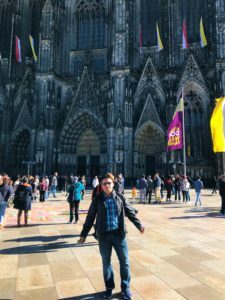 It’s not every day that a guy gets the chance to “represent” in some well-tailored lederhosen… Well, truth be known, we didn’t buy any lederhosen on this particular trip. I do, however, foresee some leather breeches in my near future. 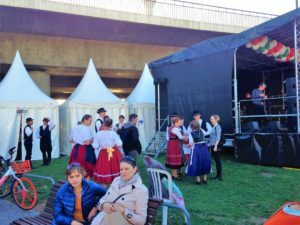 Lucky for us, Düsseldorf was throwing their own version of Oktoberfest right at the riverwalk on the Rhine. 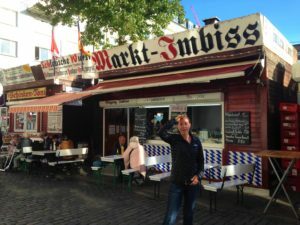 Düsseldorf is famous for their Altbier (German for old beer). 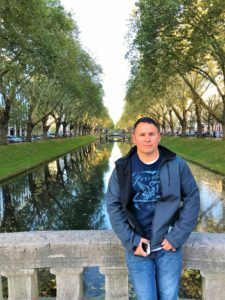 This style of beer is brewed in and around the city and its name comes from it being top-fermented, a much older method than the bottom fermentation of other lagers. 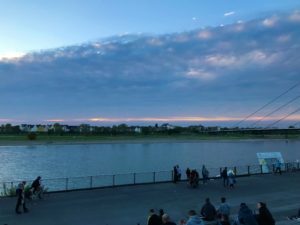 A beautiful sunset on the Rhine. 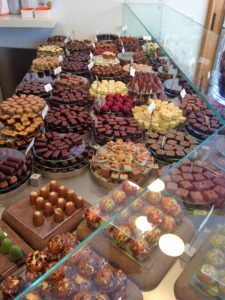 Whether you’re looking for dark chocolate with almonds or champagne truffles, Düsseldorf can satisfy all of your inner chocolate needs! 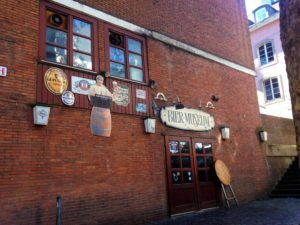 The Brewery Schumacher, located only a couple of easy blocks from our hotel, was the oldest brewery in Düsseldorf. Aside from serving phenomenal altbier, the brewery also had an impressive dinner menu. Upon entering the popular establishment, we were immediately seated with another random couple at a community table. While dining, as long as I had my glass right side up, a waiter would come by and immediate refill it with delicious beer. What you see pictured on my plate above is a very large pig knuckle. 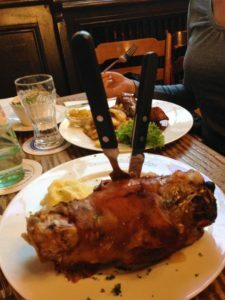 While I was leery at first, this just so happened to be the most tasty meal I had while in Germany. 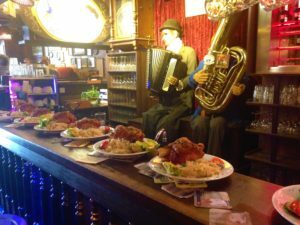 It probably seemed like all of our activities in Germany centered around food. 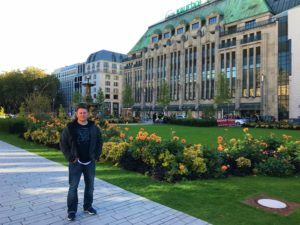 Now that I think about it, all of our activities in Germany did revolve around food. That’s one of the greatest things about travel – trying the local cuisine! 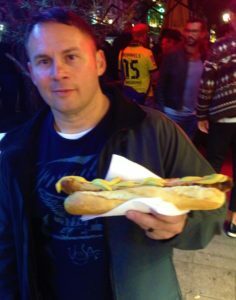 I know you didn’t think I would fly all the way to the Germany and not seek out the longest bratwurst that money could buy! 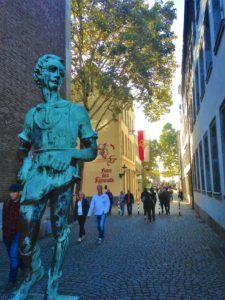 Caster Boy (Gießerjunge) is a statue built in 1932 by Wilhelm Hoselmann. 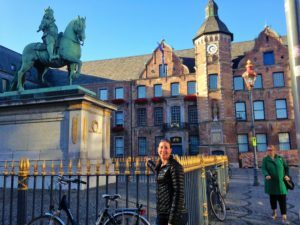 Rebecca sends me a pretty smile at the Jan Wellem monument at the Old Town Hall. Jan Wellam was an important man in Düsseldorf. 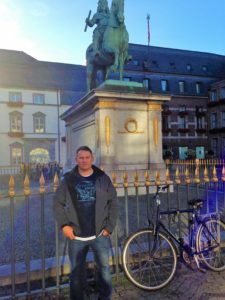 He was like the Dukes of Hazzard… Not really, he was the Duke of Neuburg, Duke of Jülich and Berg, and Duke of Upper Palatinate and Cham. That’s a lot of Dukes, but still he is no relation to Bo, Luke, or Daisy Duke. 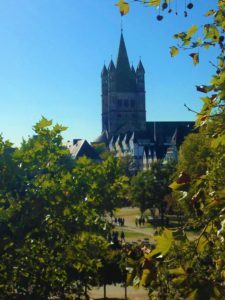 The Battle of Worringen was fought on June 5,1288 near the town of Worringen, which is now the northernmost borough of Cologne. Now somebody really got medieval with this thing! 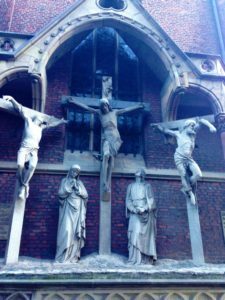 A sculpture depicting the crucifixion of my lord and savior, Jesus Christ, at the St. Lambertus Church, Düsseldorf. 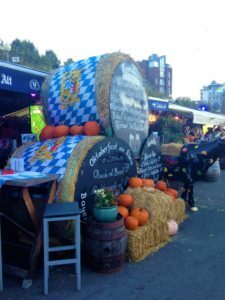 A glimpse of the En de Canon Biergarten in Altstadt, Düsseldorf. Just thinking I have the prettiest travel companion that a guy could have! 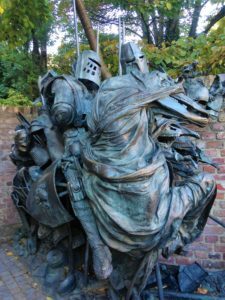 War Memorial in Hofgarten Park, Düsseldorf. 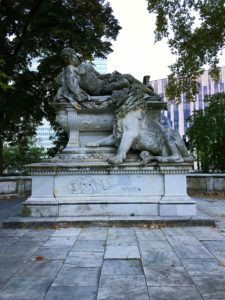 The memorial, created in 1892, was dedicated to all of Germany’s fallen during the German Unification Wars of 1864-1866 and the Franco German War of 1870. 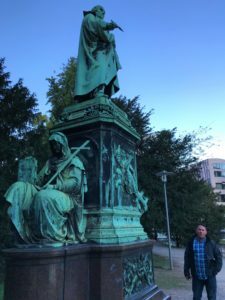 Big John admiring the Peter Von Cornelius monument in Düsseldorf. Peter Von Cornelius was a famous Fresco painter of the 19th century. The artist was well-known for painting in religious and dogmatic themes. Allow me to share a funny incident that occurred shortly after snapping this picture. Rebecca and I attempted to enter a dance club in the area but were stopped by a bouncer at the door. Naturally, Rebecca was allowed to go inside… but only if she did so without me. Apparently I was just too old for the electric atmosphere inside and was politely told to go elsewhere. Luckily, my wife stayed by my side and escorted me away from the scene. I believe she just didn’t want to be accused of abandoning a vulnerable adult. Now I feel at home with people more in my own age bracket! Hey, these old-timers really know how to let loose! Big John stands over the famous Konigsallee canal, Düsseldorf. Rebecca prepares to go shopping on the Kö (Königsallee). 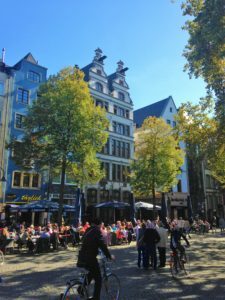 The Königsallee in Düsseldorf is known throughout the European Union for its luxury stores and exclusive shops. Next time I might try taking the picture with my eyes open. I’m adventurous like that! 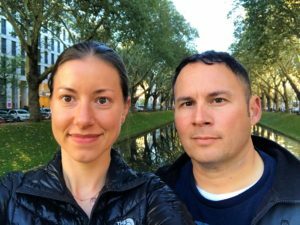 Big John and Rebecca pose for a selfie in Düsseldorf, Germany. Well now that you’ve followed us through both cities on the Rhine, It’s about time we deliver our consensus as to which place is actually better. By far, Rebecca casted her vote for Düsseldorf. 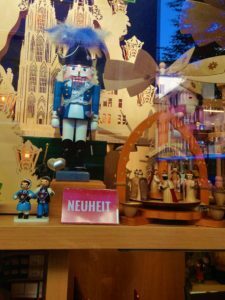 She said that it was much livelier, had better shopping, and still possessed some of that traditional German appeal that we found in Cologne. I couldn’t agree less! 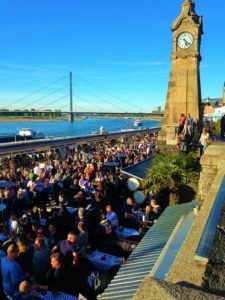 Cologne was by far a better city than Düsseldorf, unless you are solely judging the beer. In that case, both cities tie with equally phenomenal beer. Nevertheless, you’re almost obligated to side with me over her. 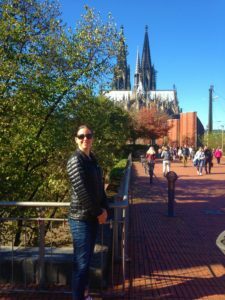 This is my travel blog and… and she’s just a silly girl (please don’t tell her I said that)!